Black Walnut trees (Juglans nigra) are a native of central and eastern U.S., but will grow in other regions of the country and in southern Canada. This massive tree can reach heights of 50 to 75 feet (or more) with similar sized spreads and can live for more than 200 years. 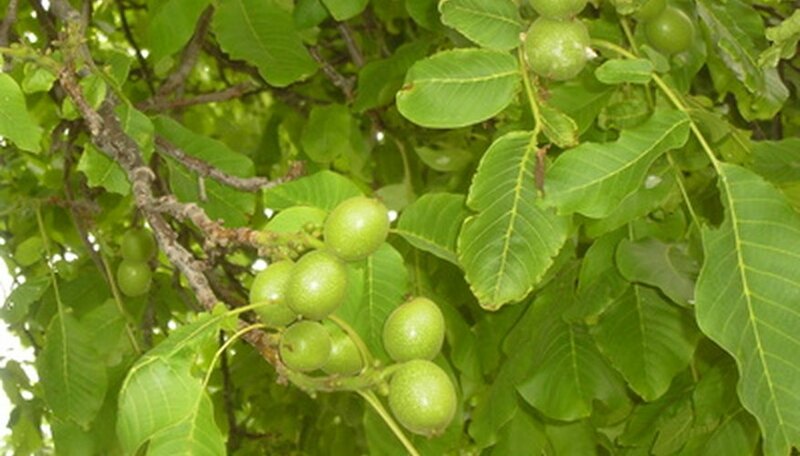 The black walnut tree is desired for its wood and nut production, but it takes more than 10 years for the first crop to appear. You can start and grow black walnut trees from nuts off another tree. Wear gloves and cover your clothing for protection against the stains from the husks on the black walnuts. Gather nuts in the fall from under another walnut tree. Collect more nuts than you need, because not all of the nuts will grow. Put the nuts in a bucket filled with water. This will soften the husk so you can remove it. Throw away any of the nuts that float. Remove the husk by hand and rinse the seeds. Place the seeds in a plastic bag and put the bag in the refrigerator. The temperature of the refrigerator should remain between 34 and 41 degrees F. The black walnut seeds require stratification (cold treatment) to germinate. Leave the seeds for three to four months. Select areas in the spring to plant the black walnut seeds that provide full sun and well-drained soil. Pick sites that allow enough space for the fully mature tree. Clear the planting area of any foliage, rocks or debris and loosen the soil. Plant at least two and up to five seeds in each location. Bury the seeds 1 to 2 inches deep. Water the seeds thoroughly. Keep all weeds out the area and watch for seedlings to appear in a month or longer. Supply water as needed to the seedlings through fall, if rainfall does not. Wait for the soil to dry before watering thoroughly. Apply a slow-release fertilizer, such as 10-10-10, as directed on label, to each growing walnut tree in the middle of July. Always water the walnut seedlings after fertilizing. Thin the seedlings to one black walnut tree per site to allow room for growth. Select the healthiest looking seedling to grow and remove the others. Cut the trees with pruning shears just above ground level beneath the root collar.